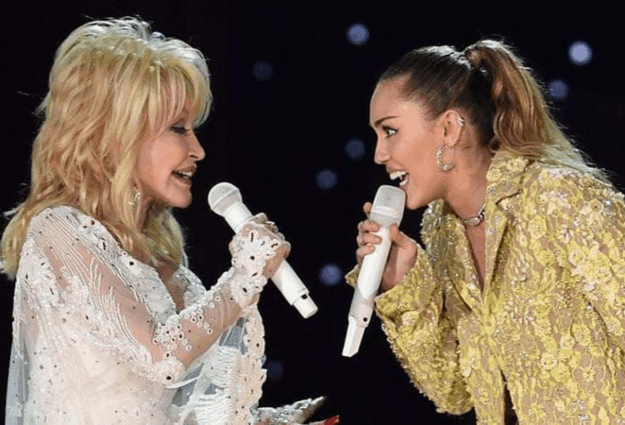 Dolly Parton and her goddaughter Miley Cyrus teamed up at the 2019 Grammy’s ceremony to deliver a stellar rendition of Parton’s iconic hit ‘Jolene’. The cover was part of a special performance honoring the country star’s career, which also garnered contributions from Kacey Musgraves and Katy Perry. The rendition was a highlight for many Grammy viewers – and attendees, with K-Pop titans BTS caught on camera dancing along. It’s certainly not the first time Parton and Cyrus had performed the song together. In 2016, Parton also invited Cyrus on stage for a rendition of the track for the 25th-anniversary celebrations of Dollywood. The Grammys Dolly tribute show even saw Parton perform a new song called ‘Red Shoes’, taken from the soundtrack of Netflix original, Dumplin‘.